ITOGON, Philippines – On 16 September, Ginalyn Franco awoke to a storm. With her grandmother and aunt, Ms. Franco, 24, raced up the mountainous Itogon terrain for three hours, braving treacherous rains, wind and mud before reaching safety at an evacuation centre. She was nine months pregnant. Typhoon Ompong (known internationally as ‘Mangkhut’) is one of the most devastating storms to hit the planet this year. 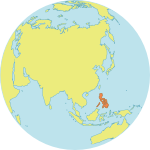 On 15 September, the typhoon made landfall in the northern Philippines, bringing landslides, storm surges and flash floods. According to the latest Government estimates, over 1.7 million people have been affected, including 270,000 internally displaced. One hundred deaths have been reported thus far – most of which are attributed to a landslide in Itogon. During natural disasters and other emergencies, pregnant women face life-threatening complications. Skilled birth attendance and emergency obstetric care often become unavailable, leaving pregnant women vulnerable to obstructed labour, miscarriage, and more. Exposure to trauma, malnutrition and disease only heightens their vulnerability. Every day, some 500 women and girls die from childbirth- and pregnancy-related causes in areas affected by natural disaster or conflict. In the Philippines, approximately 52,500 of the women affected by the typhoon are estimated to be pregnant, with roughly 17,500 expected to deliver in the next three months. Another 35,000 of the affected women have given birth in the last six months. All of these women are in need of antenatal and post-partum care. Yet many live in communities that are difficult for health workers to access. “We need to be able to reach these far-flung, geographically inaccessible areas in Benguet, Abra, Mountain Province, Kalinga and Apayao,” said Dr. Amelita Pangilinan, Department of Health Regional Director for the Cordillera Administrative Region. As needs intensify, UNFPA is working with the Government of the Philippines to ensure that women affected by the typhoon are not cut off from life-saving reproductive health care – wherever they are located. With support from the Government of Australia, UNFPA is distributing clinical delivery equipment for birthing facilities and reproductive health kits for pregnant and lactating women. “These clean delivery kits contain sterile supplies such as razors, plastic sheeting and other essential items to facilitate 1,000 safe births, while the clinical delivery equipment will be able to cover a population of 60,000 for the next three months,” said Dr. Angelito Umali, UNFPA’s Maternal Health Officer. UNFPA is also providing women’s kits – which contain essential hygiene items such as sanitary napkins, underwear, soap and shampoo – to pregnant and lactating women in evacuation centres, where conditions can make it difficult for them to protect themselves from infectious diseases. So far, 1,200 women’s kits have been distributed. As Ms. Franco picked up her own kit, she smiled resiliently. “I’m so happy to receive these materials,” she said. L’État de la pratique de sage-femme dans le monde 2014 se concentre sur 73 des 75 pays à bas revenu et à revenu intermédiaire qui sont inclus dans les rapports du Compte à rebours vers 2015.